Featuring: Jeff Goldblum, Geena Davis. 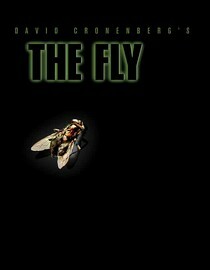 Director: David Cronenberg. There is a reason people don't believe in evolution and think stem cell research will send you to hell. Is it because of the bible? No, it's because of movies like this scare the pants off of them. Science gone terribly wrong isn't a new fear by any stretch of the imagination (ask Dr. Frankenstein) but nowadays there are breakthroughs like cloning in the news making the stuff of horror legends seem possible. This is a remake but a very well done remake. Jeff Goldblum plays a scientist (big surprise) whom through all sorts of sciencey stuff ends up turning himself into a fly. Does it sound really corny? Yes, but believe me it works. The special effects in this movie are really good and have that feel that only an 80's horror/sci-fi flick has. None of that CGI crap here, just a dude in a costume wearing lots of makeup and it really works. If you're looking for a good movie to watch during Halloween week I recommend checking out this one. Why is it in your queue? I saw some article about the 10 best movies for a horror marathon and added it. Is it artsy? No, it's 80's horror, c'mon, artsy?. Best thing about the movie? Jeff Goldblum doing some of his best sciencing. What mood should I be in to watch this movie? Curled up on the couch with your significant other. saw this and LOVED it!!! So much so we went on a "Science gone terribly wrong" movic kick and just watched Splice. Now that is an F*d up movie. I totally loved it though. You should check it out. It is at red box. They took this off streaming, it's DVD Only now!! Makes me wanna vomit dissolvent bile all over something organic. You need to take the responsibility to update your blog if you expect anyone to believe it. This movie hasn't streamed for over a year.